One of the simplifiers of understanding complicated science is Ockham’s Razor (Occam’s Razor) which generally states, “All things being equal, the simplest solution tends to be the best one.” We will see if a simplified solution for the movement apart of continents can be shown with an expanding earth globe demonstration. This experiment can be conducted at home with a standard 12″ Globe, an Expanding Earth Knowledge 12” Globe stand, and a Hoberman sphere that expands from a 6″ to 12″ diameter. A variety of types of paper, plastic or metal mesh can be used to cut out the continents. 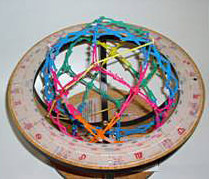 As shown below, the Hoberman sphere mechanically expands from 6″ to 12″ in diameter. This is placed into the globe stand to show the Hoberman does accurately expand to represent a 12” globe size. Plate Tectonics (PT) states that the continents moved apart on a constant size earth by moving apart horizontally on the surface. Expanding Earth (EE) theory says the Earth has expanded from about 50% of its current diameter, and that the continents fit together with no oceans, just shallow seas. EE says that primarily the continents kept their positions relative to the core, but that expansion pushed them further away from the core. In so doing the continents then moved apart. These movements were really vertical from the core, but on the Earth’s surface the movement looks horizontal. This size Hoberman sphere accurately portrays this motion. One of the initial presentations that swayed geologists to accept mobil continents as had been proposed by Alfred Wegener was the demonstration by EC “Teddy” Bullard from Cambridge University of the jigsaw like fit of the Atlantic Ocean continents. The picture in Yellow shows what became known as the famous “Bullard Fit”. Now the two continental outlines are accurately traced and cut out. A stainless steel mesh was used, which can be reshaped many times, and has some transparency. South America was colored in GREEN and Africa in BROWN. The continental cut-outs are positioned exactly according to the Bullard Fit. The far eastern point of South America fits into the corner of Africa. To the right are the two continent cutouts attached to the 6″ Hoberman. You may notice that in the Bullard Fit, Africa was made smaller and appears to be the same size as South America, when it’s actually 70% larger. For accuracy, we use the actual size. The Hoberman sphere expands out radially holding its angles. We attached the continents on only one peg point each, exactly 90º apart when looking down from the “North Pole”. The sphere is in its 6″ diameter position. White lines are used to outline the continents for more clarity. The continennts are positioned around the orangeequator on the Hoberman. 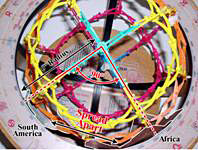 When we expand the Hoberman we can see visually that the lands appear in verysimilar position to the Earth’s equator. Just by expanding the Hoberman the continents have moved apart, showing continental mobility. Now let’s be even more accurate and compare distances moved. We measure the distance between the eastern point of South America and the corner of Africa from which it originated. 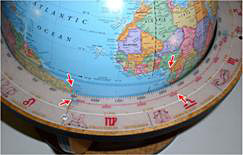 Use the globe stand and the inner “Miles” ring. We can measure the distance at just about 3,100 miles. When we measure the same locations on the expanded sphere, we again measure about 3,100 miles. Thus the expansion is almost exact.Considering that 250 million years of unusual movement takes place and that the continents must adjust to a very different spherical curve, this is clear evidence for considering an alternative to Plate Tectonics theory. A review of the two pegs we used before shows they are still 90º apart from the starting point. All that has changed is the distance from the center, or core. The exact same Hoberman sphere is used in the 6″ and 12″ photos. Any color changes were due to lighting effects. This is an experiment that can be done at home that shows evidence that the Earth Continents could have moved to their present location just by expanding the diameter of the sphere. That the earth continentscould have moved vertically away from the core and give the visual appearance of moving horizontally apart. This experiment shows what has been taught by Earth Expansion Theory for over 50 years. This experiment can be done mechanically for an Expanding Earth model but it cannot be done mechanically for a Plate Tectonic model. Which would Ockham’s Razor state was a simpler solution? This experiment was done to show how expansion alone changes continental shapes. The experiment developed 2 unexpected findings. Sam Carey’s work indicated that expansion was not symmetrical but was asymettrical. That 70% of the Expansion occurred in the Southern Hemisphere. The experiment showed a very symmetrical expansion however. 1) What this implies for future small earth continental fit reconstructions is that expansion appears to be symmetrical in LONGITUDE displacement and asymmetrical in LATITUDE displacement. 2) Another important observation occurred. This partially addresses the differences small earth modelers have had in placing Indian and Pacific Ocean landmasses. If continents can be placed on a small model and hold their positions accurately on an enlarged model, then the reverse will likely be true. A continent can be placed on a enlarged model and its original location can be more accurately determined byreducing the Hoberman model size.